NOTE: Graymont personnel provided an outstanding and educational tour of the limestone quarry and processing plant near Exshaw, AB. Any factual errors in this post are entirely due my poor memory. This last week of spring break we had the privilege of touring a limestone quarry and processing plant, thanks to one of Mr. GeoKs’ close business associates. After the Graymont staff at the plant office fitted us with steel toe covers, high-visibility vests, safety glasses and hard hats, we drove several minutes west along Highway 1A to the limestone quarry at the base of Grotto Mountain. This quarry has been in operation for over a century and it will be many decades before the high-quality limestone is exhausted. 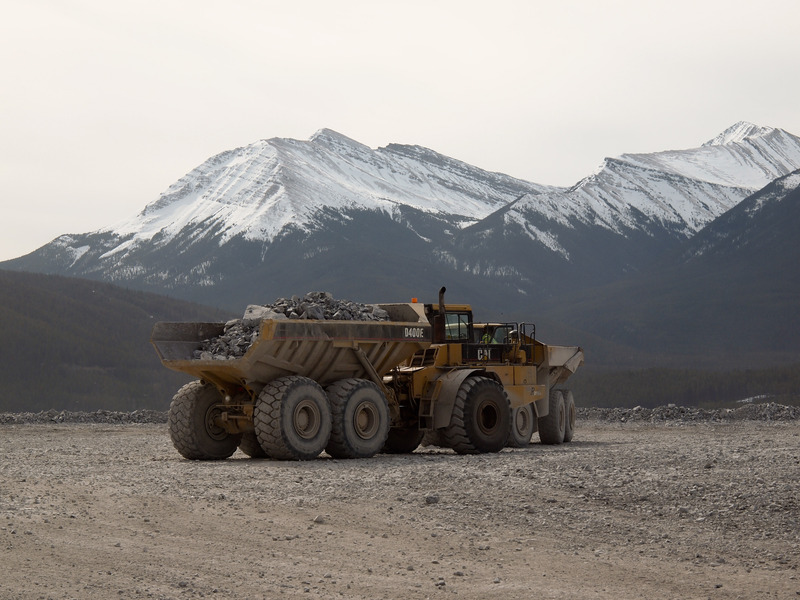 These articulated dump trucks are working in an area scheduled for reclamation. 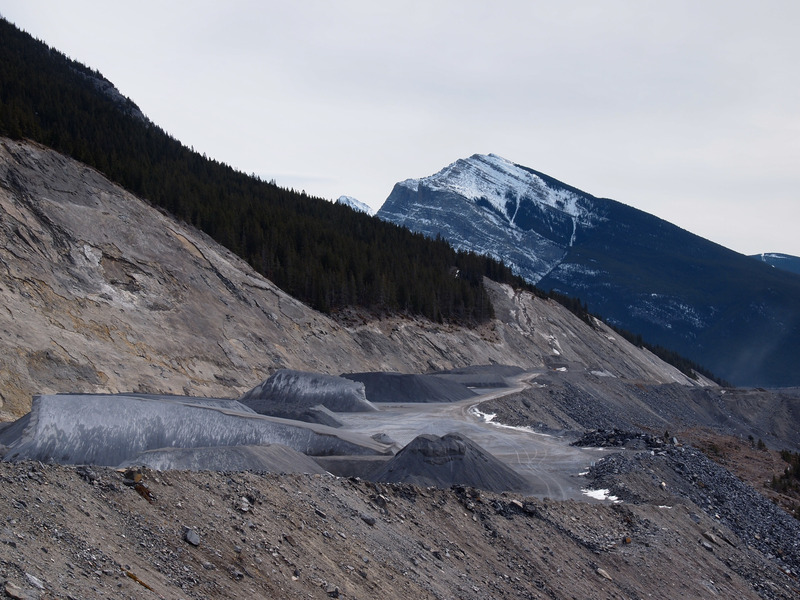 The eastern end of the quarry has been filled with waste rock, is currently being land formed and is scheduled for planting before the year is out. 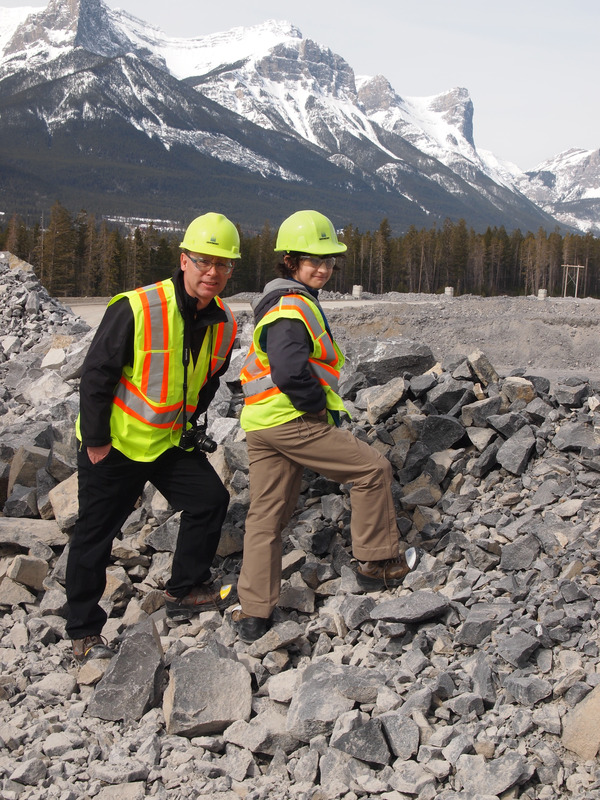 Mr. GeoK and Youngest GeoKid check out the active portion of the quarry, where drilling equipment is preparing blasting holes to loosen chunks of top-quality limestone and trailers are hauling away the quarried rock. Our Youngest GeoKid took full advantage of the many piles of rocks to search for the perfect specimens to add to his ever-growing rock collection. He located several pieces showing good sections of pure calcium carbonate. Bulk landscaping supplies stored at the quarry. 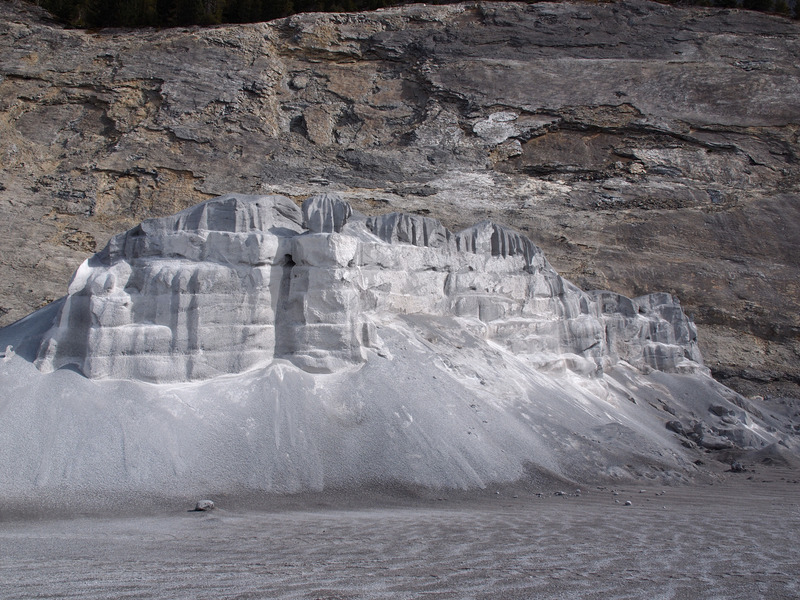 Even the very fine particles of limestone are recovered and stored for future use. Exposed to the elements, moisture-driven compaction and erosion sculpt the edges of the storage pile to resemble baby hoodoos. We noticed several Rocky Mountain Bighorn Sheep seemed to be licking or eating from a mound of small-scale limestone pebbles. Apparently finely-ground lime is often added to animal licks and to supplemental feed for cattle and chickens, so these sheep are ingesting a less processed form. 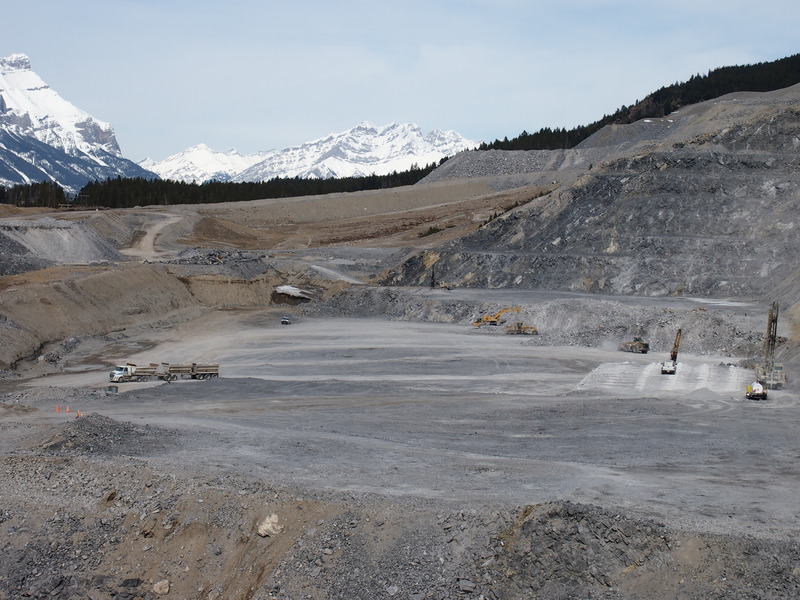 After touring the quarry from end-to-end and enjoying yet another perspective on the Three Sisters area of Canmore, we headed back to the plant site. 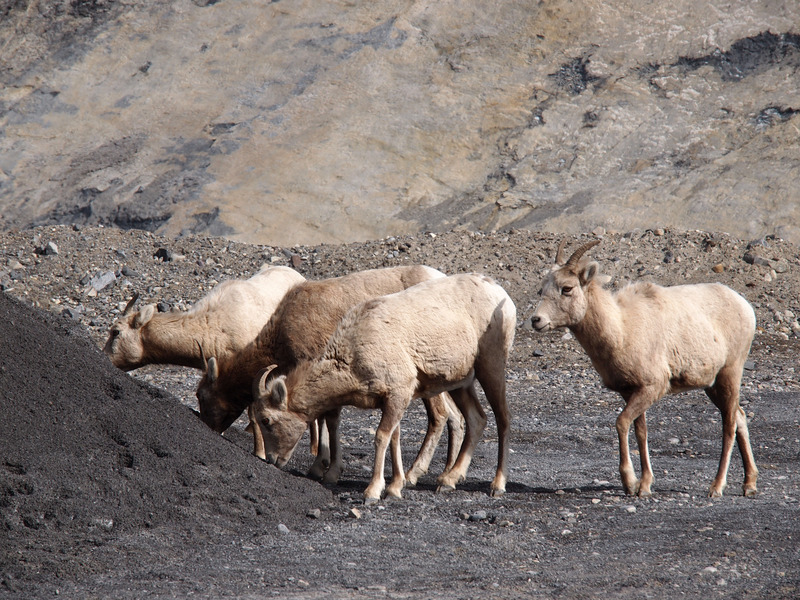 The Rocky Mountain Bighorn Sheep are attracted to the roadway to lick the salt contained in winter sanding mixes spread by highway maintenance crews. 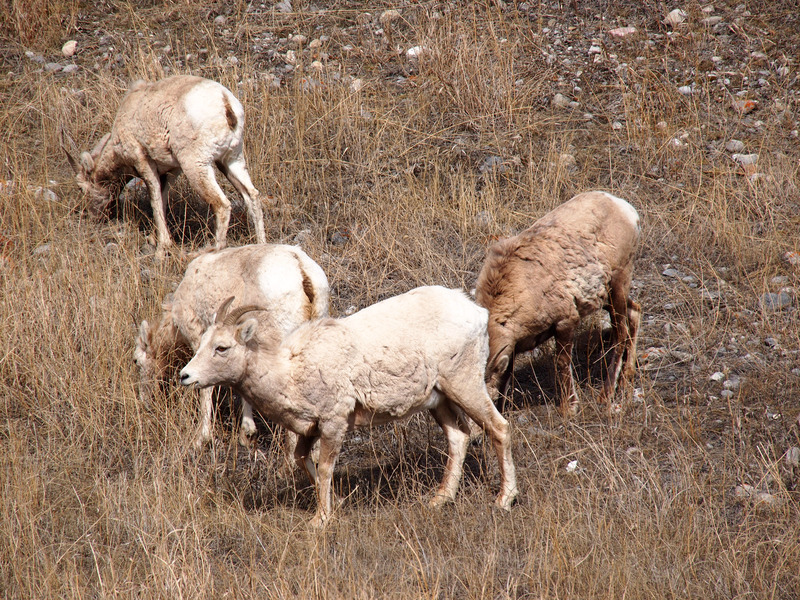 Rocky Mountain Bighorn Sheep were grazing on both sides of Highway 1A, reinforcing the need to stay below the posted 60 km/h speed limit while travelling between the quarry and the processing plant. 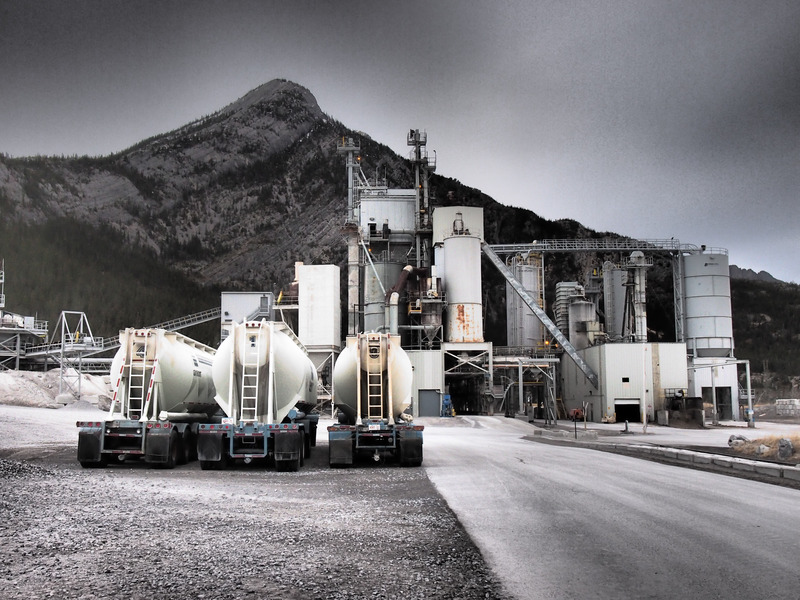 The main processing facilities at Graymont's Exshaw Plant produce high calcium quick lime. The small plume towards the right is pure steam. 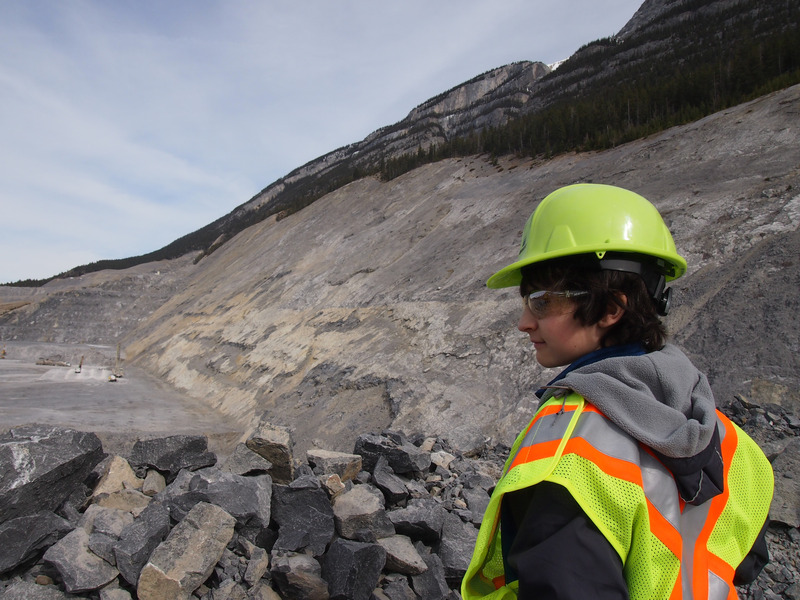 the fact that the plant manager gave up almost half his work day to explain the quarry and processing operations to us, making sure to include a demonstration or two that really appealed to the GeoKids. 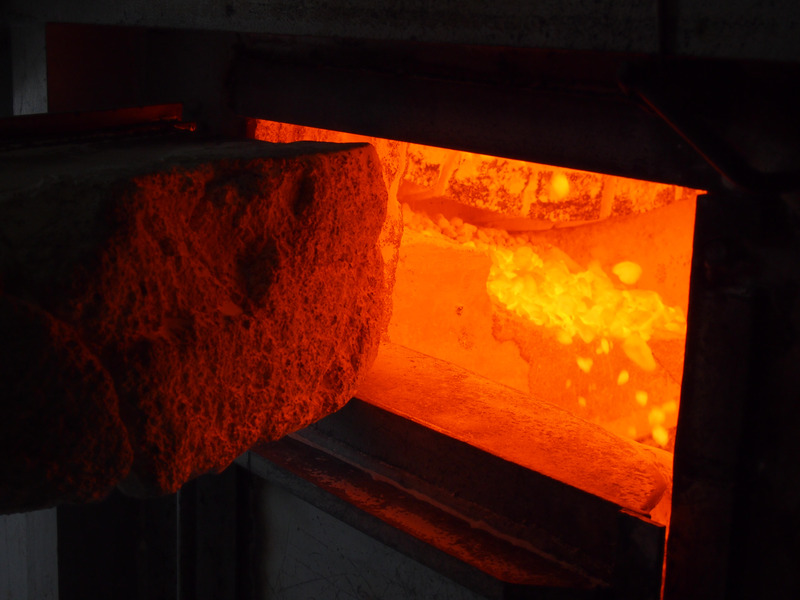 The main process uses natural-gas fired kilns to heat the limestone, which drives off carbon dioxide totalling about 50% of the original mass. The end result is high calcium quick lime. Graymont regularly investigates opportunities to recover the CO2 by-product, but the main pollution-reducing successes to-date relate to dust capture and re-use. The plant operator allowed us to take a peek inside the kiln, where the almost finished high calcium quick lime was glowing red hot. 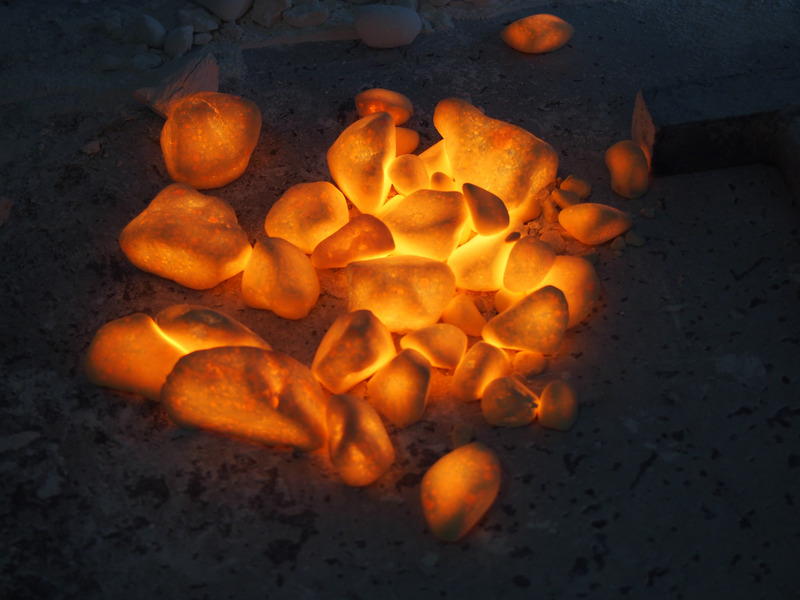 These glowing chunks of high calcium quick lime were scooped out of the access door to the kiln. After they cooled down a bit, the plant manager demonstrated a simplified version of the process for making high calcium hydrated lime. A bit of water on one chunk caused it to explode into a fine white powder. 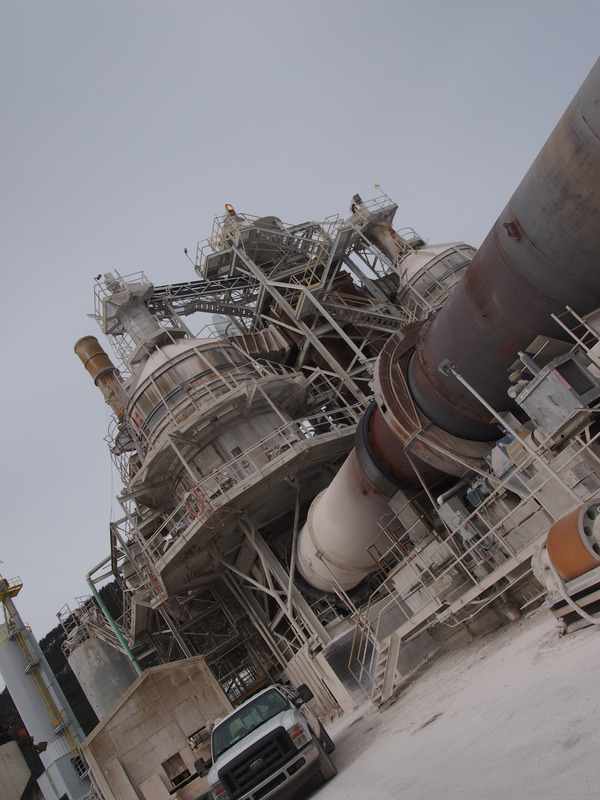 Additional processing facilities at the plant include a small pellet-making facility (primarily for agricultural applications of lime) and various pulverizing and screening processes that produce a wide-range of landscaping and other materials. Thanks very much to Graham for arranging this tour, to Sira and Dennis for investing so much time teaching us about your business, and to all of the Graymont personnel for your willingness to let us peek over your shoulders for an up-close look at things.